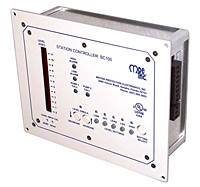 MPE Controllers - B&M Technical Services, Inc. The SC2000 is a SCADA ready pump controller designed to perform level control in a wide range of lift station applications. The SC2000 operates the pumps based on the selected setup values and the wet well level signal. The level input source is menu selectable for either a 4-20 mA pressure transducer, or a conductance probe. The SC2000 alternates the pumps, performs lag pump delays, and provides high and low level alarms. The SC2000 has a variety of control options available in the setup menu that may be used to customize the controller for a specific application. Optional I/O is available for VFD speed control and for additional telemetry inputs. 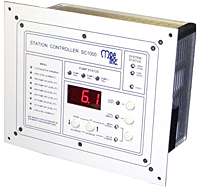 The SC1000 is a SCADA ready pump controller designed to perform level control in a wide range of lift station applications. The SC1000 operates the pumps based on selected setup values and the wet well level signal. The source of the level input signal is menu selectable as either a 4-20 mA transducer or a 10 point conductance probe. The SC1000 alternates the pumps, performs lag pump delays, provides high and low alarms, and has a variety control options available in the setup menu to customize the controller to the application. 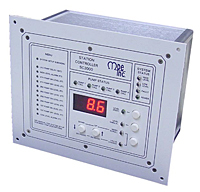 The SC100 controller is a low cost, simple to use duplex controller with an analog input for level control. 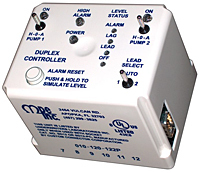 The controller contains four output relays; for pump 1 and pump 2 call, and for high and low alarms. A regulated 24 V DC power supply is provided for powering the pressure transducer circuit. The controller contains a red LED bar graph to display the level, and red LED’s to display Pumps 1 and 2 call, and the high and low level alarms. There are additional red LED’s for the level settings and level simulation, which are turned on by depressing the Setting Select pushbutton. The controller also has a 10 second power-up delay, and a 5 second lag pump delay to prevent the turning on of one or both of the pumps immediately after a power interruption. The Intrinsically Safe Duplexer ISD, is a low cost, intrinsically safe duplex ISD pump controller for water and wastewater lift station applications. The controller's (4) intrinsically safe float switch inputs allow safe handling of float switches by lift station personnel. The ISD Controller provides intrinsically safe circuits for use in Class I, Groups A, B, C, D Class II, Groups E, F, G and Class III - Hazardous locations. The DUPLEXER is a low cost SCADA ready pump controller designed to perform level control for duplex lift station applications. The level inputs can be connected to either four float switches or to a conductance probe. The Duplexer provides a 10 second power-up start delay, 5 second lag pump delay, and duplex alternation. LEDs provide power on status, level input status, pump call status, and high level alarm status indication. Pump 1&2 call and high level alarm relays are provided. HOA and lead select toggle switches are also provided. The high level status indication latches upon high level, until reset by pressing the reset push-button (the relay does not stay latched). Level simulation is accomplished by pressing and holding the push-button. Releasing the push-button allows the simulated level to return to normal. Connecting the serial port to a SCADA system allows the lift station to be monitored and controlled remotely. By connecting a programming device to the serial port (MPE p/n TSID), a number of settings may be accessed to customize the unit.